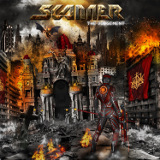 After a long hiatus in which they stuck to touring, German 80s heavy metal outfit Scanner has -- minus the rather controversial female vocalist from their last album -- turned out their first album featuring post-Scantropolis singer Efthimios Ioannidis. Scanner was a promising band that kept getting plagued by split-ups and halts; The Judgement moves away from the original sci-fi themes and their rather poppy recent material to a much heavier, dirtier sound that is quite fun to listen to. F.T.B. quickly reveals this new focus with hammering speed metal riffing and screaming guitars, something that sounds like it comes off an 80s Running Wild or Riot album. Ioannidis is a tough-sounding, competent heavy metal singer whose gritty voice is quite a contrast to what they had in Lisa Croft, and he can hit the high tenor notes with an operatic aplomb on Nevermore or top out with a Halford-style scream on Warlord. Speaking of which, the choruses on these songs are fist-pumping masterpieces. Scanner had always been able to write a great melody and the verses are good, but the running bassline on Warlord, a double-kick drum fiercely pounding in the background, is custom-made for headbanging. Eutopia and the title track are good, going back to their progressive roots, but their attempts at progressive power don't quite meet the high standard exacted by the previous tracks, though the screeching guitars and Ioannidis's falsetto screams do a lot to make it palatable. Pirates is better melodically; though the beat and a bit of the melody have been done before by Running Wild, its echoing choruses and swinging beat are done so well and so heavily that it still has the power to inspire the listener. Known Better is less focused, especially on the verses, which meander around rather amelodically till it gathers all its strength for a chorus that isn't particularly great. The Race switches back to power metal, Ioannidis channelling a lot of Bruce Dickinson; the chorus seems like it tries a bit too hard, but all that guitar heaviness, especially in this track's solo, makes up for a lot of shortcomings, while the final track, The Legionary, switches to a slower but much more epic feel. The beat changes from time to time in a way I found a bit confusing, yet overall it works; the descending chorus line is not only a good match for the melody, but the guitar solos and double-kick drumming they like to do on this album can --and do -- hang easily off this tune. Overall, I think Scanner fans are going to be pleased with this one. Though I thought the previous pop sound of Scantropolis wasn't a deal-killer for me, I must say that long-time fans will probably like this style a lot more. It's true that a lot of the progressive trimmings have gone by the wayside in favor of a more traditional approach, but who cares? It's a well-made, enjoyable album with some great tunes, and that's all it tries to be.